MASCAR stands for Miniature American Stock Car Auto Racing and these cars are just as they sound – US-style NASCAR racing in miniature! While grids may not be quite as big as the 43-car grids on the big American ovals, these small yet spectacular machines can certainly deliver racing that is just as close and competitive. They are powered by Superbike engines similar to those seen in Legends cars, and have become fan favourites wherever they have raced over their history. 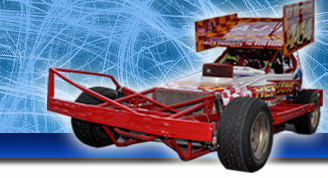 Their small size makes three- and even four-wide racing possible, especially at Birmingham Wheels where they are part of the I-Factor Fast and the Furious series, and they are also well-suited to the banking of Hednesford.